Ambient light, thermal gradients, vibration/motion or electromagnetic radiation can be harvested to power electronic devices. EnerChips enable high-efficiency Energy Harvesting (EH) designs that convert the relatively low levels of energy into an amount that can provide the power for an electronic system. 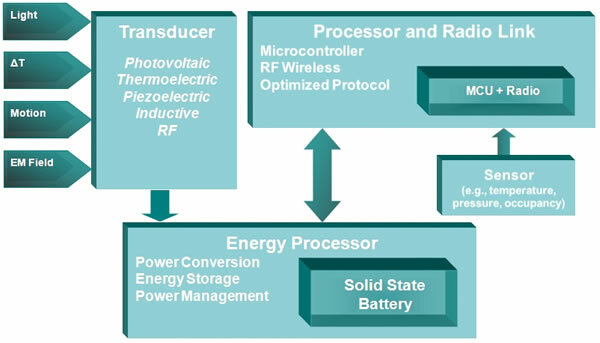 The diagram below shows the major components of an autonomous wireless sensor which are the EH transducer, Energy Processing, Sensor, Microcontroller and the Wireless Radio. There are 3 key areas in the Energy Processing stage that must be addressed for successful EH implementations: Energy Conversion, Energy Storage, and Power Management. There are cases where there is not enough ambient energy to power a device and a larger battery must be used. However, energy harvesting can be used to significantly extend the life of the battery. Cymbet EH solutions (especially solar) can be combined with primary or rechargeable batteries to extend their life. Click here for the EVAL-10 Solar Eval Kit Data Sheet that describes battery extension. Cymbet provides several different Energy Harvesting evaluation kits that demonstrate primary power and battery extension. An Energy Harvesting power management system must be capable of capturing, converting, storing and delivering energy in a form that can be used to provide the power needed by the system it serves. A typical Energy Harvesting system starts with an energy collector or transducer device and depends on the type of energy one is trying to convert. These are typically solar or photovoltaic cells for light energy, piezoelectric for pressure, kinetic for movement, inductive for rotational or motion, thermoelectric for heat or temperature differential, and electromagnetic. The energy collected from these transducers must be converted to a form that can be stored for later use. In remote sensor systems or portable device applications that use Energy Harvesting a small rechargeable battery or storage capacitor is often employed to store the collected energy the system needs for operation. The drawbacks to each of these storage methods are numerous in that even rechargeable batteries wear out after a few hundred charge/discharge cycles and need to be replaced and super caps while they eventually change their characteristics, will self discharge rapidly, as much as 20% per day, causing much of the converted energy to be wasted. A more robust and permanent solution is to use an EnerChip solid state battery as the energy storage element in the system to eliminate the need for replacement since it can support in excess of 5000 cycles and has a minimal self-discharge of less than 3% per month. The final stage of the system conditions to stored energy to suit the requirements of the system. This could be as simple as a regulator and level shifter to a complex power control circuit that intelligently manages the power distribution to the system based on power needs and system operation. 4 – Identify the EH conversion and power management electronics to be used and add the power used to the overall total. 5 – Size the energy storage device (solid state battery) to cover all the system energy storage and power delivery requirements. Reference schematics of these systems can be found in the Cymbet EVAL-09 datasheet and the EVAL-10 data sheet. The definition of an energy transaction is “the amount of discrete energy required to perform a certain task or functional transaction”. This concept of energy transaction is very useful in the design of energy harvesting-based systems. In order to calculate the power budget and power boundary conditions for an EH-based system, all operating and quiescent power states of the system must identified. Each of these states requires an energy transaction level to function. Identifying all the various energy transactions will determine the sizing of the Energy Harvesting transducer and the energy storage devices. To optimize the performance of energy harvesting based systems, it is critical the high efficiency energy conversion technique of maximum peak power tracking (MPPT) be used. 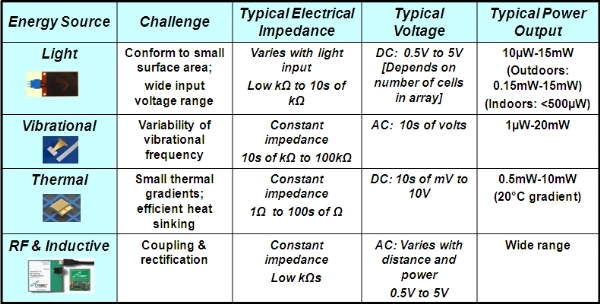 MPPT can adapt to either constant impedance or variable impedance EH transducers. 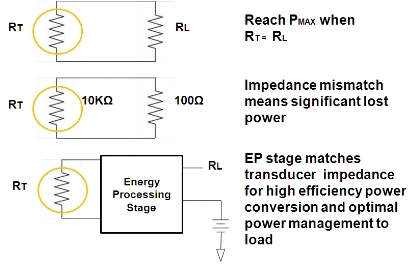 MPPT is used to match the impedance between the energy harvesting transducer and the system load as seen in the diagrams below. The EnerChip EP Energy Processor CBC915 implements an optimized version of MPPT. 1 – Optimize for low average power in the system. 2 – Firmware efficiency is key; no loops, etc. 3 -Use hardware timers and interrupts. Isolate loads; all loads should be switchable. 4 – Watch power leaks via back-feeding other devices. 5 – Net power is a tradeoff between dynamic and static power. Quick processing with high power may be better than slow processing with low power. 6 – Usually better to process data and send result vs. sending data for processing elsewhere. 7 – Wireless protocols and topology must be minimized. 8 – Power up sequencing – must understand implications of when to power each device along with other devices. 9 – Every MCU vendor provides hints and tricks to minimize power. 10 – Use Energy Processing devices that provide status indications so informed power management choices can be made. Wireless Sensor Networks (WSNs) is the term that is used for wireless sensor and control networks that use batteries or Energy Harvesting techniques to power the device. With the availability of low cost integrated circuits to perform the sensing, signal processing, communication, and data collection functions, coupled with the versatility that wireless networks afford, we can move away from fixed, hard-wired network installations in both new construction as well as retrofits of existing installations. A major drawback to moving toward large scale wireless sensor network installations is the poor reliability and limited useful life of batteries needed to supply the energy to the sensor, radio, processor, and other electronic elements of the system. This limitation has to some extent curtailed the proliferation of wireless sensor networks. Legacy batteries can be eliminated through the use of Energy Harvesting techniques which use an energy conversion transducer tied to an integrated rechargeable power storage device. This mini “power plant” lasts the life of the wireless sensor. Click here for the ISSCC paper describing the millimeter scale sensor shown above. Zero Power Wireless Sensors require energy processing low power management circuitry to condition the transducer output power, store energy and deliver power to the rest of the wireless sensor. In most environments, any of transducers producing power cannot be relied on under all circumstances to continuously supply power to the load. While each transducer delivers power at some amplitude and with some regularity, they do not store energy. Consequently, when that source of power is not present, there would be no power to supply the load in the absence of an energy storage device. Moreover, the transducers typically do not deliver power at the proper voltage to operate the electronic system; therefore, conditioning of transducer power is essential to making the power useful in operating the sensor, processor, and transmitter. 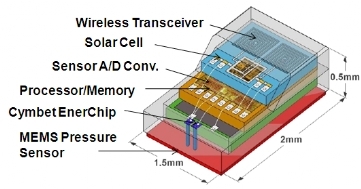 In particular, without an energy storage device, it would be difficult or impossible to deliver the pulse current necessary to drive the wireless transmitter. Traditional rechargeable energy storage devices such as supercaps and coin cell batteries have severe limitations with respect to charge/discharge cycle life, self-discharge, and charge current and voltage requirements. Wireless sensor systems are becoming more prevalent due to the rising installation costs of hard-wired sensor systems, availability of low cost sensor nodes, and advances in sensor technology. Energy Harvesting-based autonomous wireless sensor nodes are a cost-effective and convenient solution. The use of Energy Harvesting removes one of the key factors limiting the proliferation of wireless nodes – the scarcity of power sources having the characteristics necessary to deliver the energy and power to the sensor node for years without battery replacement. Significant economic advantages are realized when Zero Power Wireless Sensors are deployed vs. hard-wired solutions. Additional savings are realized by removing the significant costs of battery replacement. Combining Energy Harvesting transducers, an Energy Processing Power Module, low power sensor, an energy aware Microcontroller, and an optimized RF Radio link delivers the reality of long life, maintenance-free Zero Power Wireless Sensor Networks. We look forward to accelerating your new design projects by leveraging the advantages of Cymbet EnerChip rechargeable solid state batteries, power management and integrated solutions.